Sakena Yacoobi, who received the 2009 Henry R. Kravis Prize in Nonprofit Leadership for her efforts to educate women and children in Afghan refugee camps in Pakistan and elsewhere, has become the latest in a series of Kravis Prize recipients to be awarded the World Innovation Summit for Education (WISE) prize. Yacoobi accepted the award, which includes a $500,000 cash prize, during a WISE conference held earlier this month in Doha, Qatar. 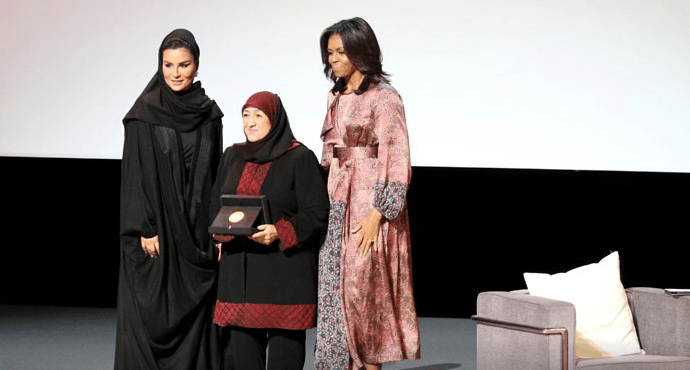 The conference also featured remarks by U.S. First Lady Michelle Obama and Sheikha Moza bint Nasser, who is the mother of Qatar’s emir (pictured, above, with Yacoobi, center). “It is particularly meaningful because this is such a crucial time in Afghanistan,” Yacoobi said of the award, expressing her wish to dedicate the prize to “the AIL and all of the women, men and children we are educating.” AIL refers to the Afghan Institute of Learning, which Yacoobi founded in 1995. According to the Saudi Gazette, the $500,000 prize from WISE, which was established by the Qatar Foundation, honors individuals and teams that are bringing real educational change to communities around the world.